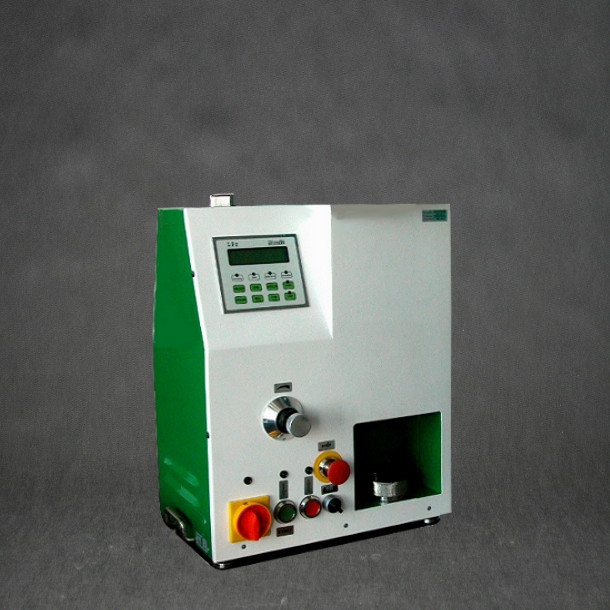 Molding sand examination for determining the wetting degree, especially for automated molding machines. The mold material is filled in a testing pipe (length: 100mm, diameter: 50mm) and compressed with 100 N/cm² in order to determine the compressibility. The decrease in volume compared to the starting volume represents the compressibility in percent and a direct measure for the molding mold material wettability degree. Figure 1 shows a testing device for compressibility tests, Figure 2 shows an examination model. Compressibility and bulk weight are interdependent. A mold material with a lower bulk weight can be compressed more easily so that it has a high compressibility. A mold material with a higher bulk weight achieves a higher packing density after the testing vessel has been filled so that the achievable compressibility is lower. However, compressibility and bulk weight do not only depend on the water water content but also on the sand temperature. Increasing temperatures at the same humidity content of the sand result in a lower bulk weight and a higher compressibility. There is another linear relation between sandflowability and its compressibility in a way that the higher the compressibility is, the lower flowability becomes (datec Dosier- und Automationstechnik GmbH). Setting and maintenance of a basic water content which is adjusted to suit the type and intensity of compaction is a basic requirement for a high molding material and mold quality. 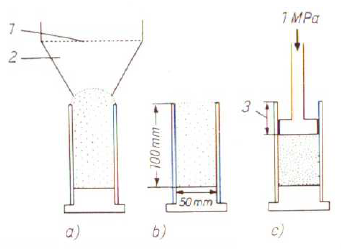 The state between the two maximum values of green compressive strength and gas gas permeability is suitable for hand molding and can be assigned to a compressibility of approx. 45 percent. Mold materials for modern compression processes with this parameter can also be characterized regarding the optimum water content. The knowledge and the correct interpretation of “moisture content” is also the basis for an objective comparison and a process-oriented optimization of clay-bonded mold materials. It is customary with modern mold processes to set the compressability degree to approx. 36 to 42 percent. The test procedure can also be automated and combined with a compressive strength examination and a bending strength determination of core sands (see mold sand examination, paragraph on compressibility). Another variant of the compressibility measurement is used with the compactability controller. This appliance is used for the direct control of water addition in the mixer in a way that the sand leaves the mixer with the relevant desired compaction degree.